"Excuse me mate but 'ave you got 'De Futura' by Magma, 'London Acid City' by Lochi and Leh Jani by Omar Souleyman? What? You have? 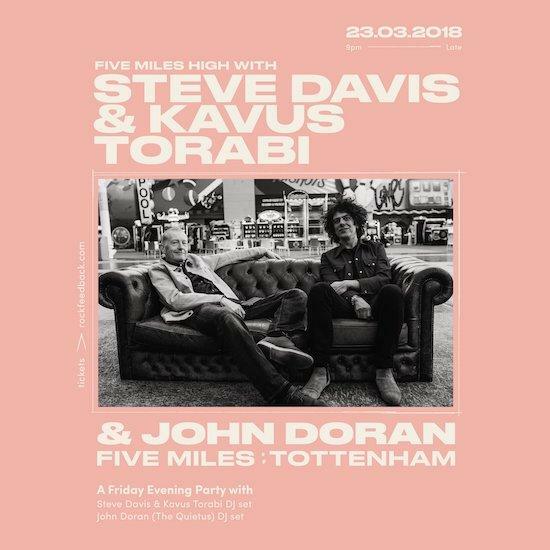 Blinding..."
Steve Davis and Kavus Torabi are DJing at the Five Miles Bar/Club/Restaurant on Friday night in East London. The epic prog/ techno/ Arabic funk/ cosmic disco bash starts at 9pm and goes on til 4am and also features tQ editor John Doran as warm up selector. Steve's success as a snooker player has given him a lot of time to indulge in his musical hobby, namely collecting left field music from around the globe and presenting a weekly Radio show on PhoenixFM with Knifeworld/ Cardiacs/ Gong mensch Kavus Torabi and more recently DJing to large club and festival crowds around the UK. As the FB event page says: "An explanation of their live DJ set is hard to narrow down but it is effectively across the board weird and left field Prog Bangers with Quality Electronic and top end Techno slung into the mix." And warming up John Doran will be playing Afrobeat, Egyptian wedding rave, dabke, Lebanese disco and techno. You can get tickets to Friday's event here.